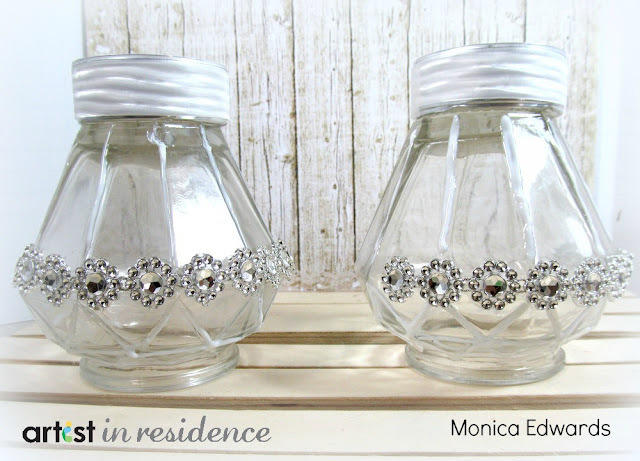 It’s going to be a White Christmas with these white one white sparkly repurposed jars votive candles. I have always enjoyed repurposing things around the home into something beautiful for Christmas and these Votive candles make the perfect gift for a friend or love one. 1. Cut 2 - ½ strips of vertigo which will be used to cover the outer cover of your candles. 2. Cover each votive with the strip of vertigo you just cut and wrap it around the candle as seen below. Then set them aside. 3. Take you Stazon Studio Glaze in white and create a decorative pattern on the outside of the glass jar. Let this completely dry before moving on to the next step. 4. Once dry turn the jars over and glue the votive candles on top of the jars. 5. Next apply a strip of decorative trim. I chose some silver trim that has a very nice shine to them using my Tear IT! Tape. Once done you have a gorgeous Christmas votive candle!! LOL Yeah, Melanie, I thought maybe it was just me --- I don't get any pictures either. white on white, funny!